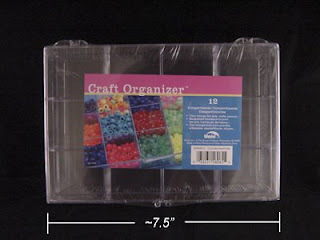 There is a particular bead-organizing box that they sell at Wally World (see picture below), in the craft section, that I just love. You'll find these type of boxes with the multiple sections everywhere, but I like these for a few reasons. They are perfectly clear, so I can always see what's in them (see previously explained "out of sight, out of mind" aspect of my organizing.) Also, the interior dividers go all the way to the lid, so the little things aren't always getting mixed into other compartments. At about 7.5" long, and 1.75" tall, they're a useful size for storing quantities of miniature bits and pieces. And finally, they're only $1.99, can't beat that! A few ideas for using them (these are the stacks on my worktable): one holds a variety of pre-made polymer clay bits for projects, like canes, candies, fruits & veggies, etc. A couple more keep all my unfinished metal minis organized till I'm ready to paint them, another holds unpainted ceramic minis, and another for unfinished wood items. I also use them for projects in progress, to keep all the parts organized and dust-free until I get back to it. And of course, you can always use them to store beads! I love these boxes! I use these with some of my beading projects. I bead in miniature so not only can it hold my beads, thread etc but can also hold my mini looms! Perfect size to make it so easy to stick in my purse for beading on the go.